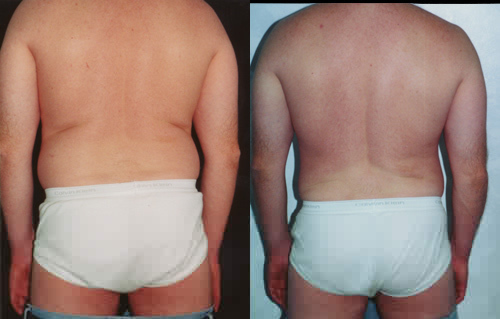 Liposuction of the love handles in Los Angeles by Aaron Stone MD can improve your body shape. Liposuction liposculpture is a procedure that can help sculpt the body by removing unwanted fat from specific areas, including the abdomen, hips, buttocks, love handles, saddlebags, waist, thighs, knees, upper arms, chin, cheeks and neck. Although no type of liposuction is a substitute for dieting and exercise, liposuction can remove stubborn areas of fat that don’t respond to traditional weight-loss methods. 39 years old, 5’10” tall, 200 lb. 42 years old, 5′ tall, 115 lb. Before and 2 years after surgery. Liposuction surgery liposculpture can enhance your appearance and your self confidence. Realistic expectations are important to be happy with any surgery. As each patient is an individual, different results can be expected in each patient. The alternatives to love handles liposuction are growing. We now have Coolsculpt to freeze fat away and Kybela or Ilipo to melt it away by injection or infrared. There are new technologies coming out every day. However they require multiple treatments over a number of weeks. Liposuction is a one time 60 to 120 minute procedure. As with any type of surgery there is the risk of infection or bleeding. Additionally with liposuction there is the risk of seroma fluid collections under the skin, bruising, uneven surface contour and unaesthetic result if the surgeon ignores normal body surface contours. These risks are small and less likely if you choose your surgeon wisely and follow the postoperative instructions. In order to achieve an optimal result the surgeon has to assess where the fat is concentrated by finger pinch because it is not evenly distributed under the skin. Then he or she has to account for natural body contours (concave and convex surfaces) during the removal process to recreate these contours. On the back a distinction needs to be made between love handles, hip and buttock fat. This is made more difficult by the common use of fluid injection just prior to liposuction removal of the fat — tumescent or superwet liposuction. Overly aggressive removal to just get fat into the liposuction cannister can damage the overlying skin causing pigmentation changes and/or scarring and pitting or unnatural surface contours. At the extremes these irregularities are not fixable. 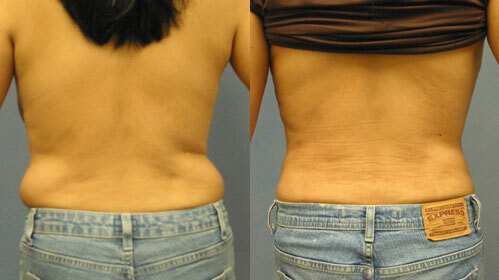 Currently most love handles liposuctions involve fat grafting to the buttocks for the best results. Fat grafting has its own inherent risks such as incomplete take of the fat grafts or fat emboli, especially if the inject cannulae are not blunt. The benefits are not being self conscious in a bathing suit at the beach, when wearing midrif exposing shirts or when being intimate and achieving a more hourglass shape for women. Being pleased with your new appearance can be a major incentive to changing your lifestyle, diet and exercise regularity in order to maintain your new look. In order to collapse the channels from which the fat is removed patients need to wear pressure garment that compress the skin and fat layers preferably with foam padding. This minimizes swelling, makes recovery faster and prevents the collection of seroma fluid in the fat layer. Compliance with pressure garment wear and activity restrictions for 3 to 4 weeks are crucial to obtain optimal results without complications. Going to the gym, jogging or exercising too soon can stimulate the body to secrete fluid into the liposuctioned space. If severe or ignored this fluid can stretch the skin, require office needle aspiration or require a return to the operating room.